Most Dal students, staff and faculty know the name “Munro” well; it’s right there on the academic calendar in the form of Munro Day, Dal’s beloved university-wide holiday each February. 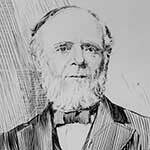 But how many know much about the man behind the holiday, George Munro (1825 – 1896), who helped save the university from closure in the late 19th century? Munro would go on to endow chairs in History, in English Literature and in Rhetoric, Law, and Philosophy. He also donated $83,000 in bursaries, some of which went to support several of Dal’s first female graduates. All told, Munro donated about $330,000 to the university, equivalent to about $10 million today. So how did he “find” all that money? He was a man of words — cheap, discount words. Born in West River, Nova Scotia, Munro was a teacher at the Free Church Academy in Halifax before moving to New York City in 1856 to make his fortune in publishing. Within 10 years, he rose through the ranks, eventually becoming owner of Irwin P. Beadle and Company, a popular producer of dime novels, songbooks and cheap handbooks. But throughout, he remained passionate about education, as his career and gifts to Dal demonstrate. Munro died in 1896, mere days prior to Dalhousie’s convocation ceremonies that year. Reverend Robert Murray, a Dal governor, paid tribute to Munro, describing him as “a true educationist and the patron of education.